Shivakumara Swami known as “Nadedaduva Devaru” (Walking God) the beloved seer in Karnataka, India died on January 21, 2019, at 11:44 a.m. IT. Swami had been on life support for several weeks after suffering from lung infections and other illnesses related to aging. He was 111 years old. Immediately following Swami’s death, the government in Karnataka announced there would be a three-day state morning. Educational institutions and state offices will be closed beginning on Tuesday. 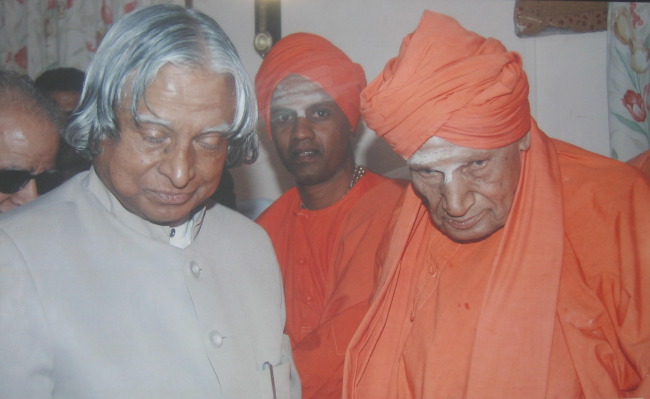 Swami was a revered religious figure and renowned Lingayat seer. His followers considered him a ‘walking god,’ and believed he was an incarnation of the social reformer Basava who lived in the 12th century. In 1930, he joined the Siddaganga Mutt becoming their seer in 1941 following the death of Udana Swami. He also headed the Sree Siddaganga Education Society which ran more than 125 schools. Many of these schools offered free tuition and housing for poor students. Born in a Veerapura village in Karnataka on April 1, 1907, he was the youngest male child in his family. In 1930 he entered virkat ashram to become a monk. His teacher was pontiff Sree Uddana Shivayogigalu who renamed him Sree Sivakumara Swami. Graduating from Central College of Bengaluru, he spoke English, Kannada, and Sanskrit. In 1965, he was awarded an honorary Doctor of Literature by Karnatak University. In a Twitter post, Prime Minister Narendra Modi wrote, Dr. Sree Shivakumara Swami lived to help the people, especially for those who were vulnerable and poor. He devoted his life to stopping hunger, social injustice, and poverty. His devotees around the world gather in prayer and solidarity. Indian National Congress President Rahul Gandhi tweeted that the passing of the seer, pontiff of the Siddaganga Mutt will leave a spiritual void which will be difficult to replace. Thought and prayers were sent to all of his followers. Swami was the recipient of several awards. The first was granted in 2015 and was the Padma Bhushan. When Swami turned 100, he was the awarded the highest civilian award, Karnataka Ratna given by the Karnataka government. Prior to his death, Swami was considered one of the oldest living people in India. His cremation is set for Tuesday, Jan. 22 at 4:30 p.m. IT. 2 Responses to "Shivakumara Swami ‘Walking God’ Dies at 111; 3-Day State Mourning Declared"